A photovoltaic (PV) value is the voltage output generated by solar cells that harvest solar energy to produce electricity. The PV value is a critical performance indicator of solar panels consisting of a plurality of solar cells (Fig. 1a). 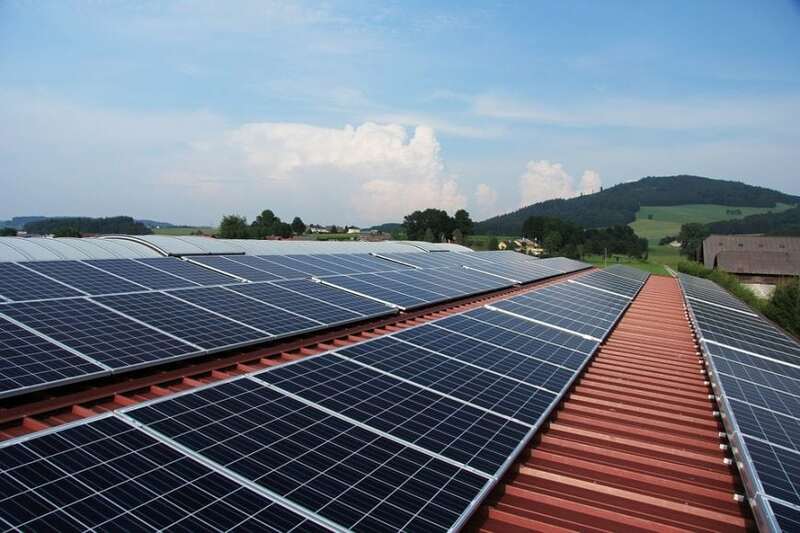 Appropriate PV forecasting over time can help PV farms/plants efficiently supply the solar energy for power grids, without overestimating or underestimating the capabilities of solar panels, thereby balancing the power demand and supply. The PV forecasting also helps detect abnormal variations/degradation due to cumulative temporal effects such as corrosion built up over time that prevents efficient power generation (Fig. 1b). Traditional PV forecasting relies on data mining methods to progressively predict the PV output over time as reflected in historical data such as time series modeling and artificial neural network [1-5]. The limitations are that the accuracy is restricted by the data availability when data recordings are missing due to many reasons. For instance, data collection may be interrupted by data measurement equipment failure and erroneous recordings. There exist multiple large gaps in the data and these intermittent wide gaps seriously affect the forecasting accuracy. A new opportunity emerges in improving the PV forecasting by sharing the knowledge/information available from other solar panels collected under similar-but-non-identical conditions. For example, when a new solar panel may not have sufficient data, the history of an old solar panel of the same type under similar deployment conditions can potentially provide cross inference about this panel. However, the older panel is not operated under the same condition, and therefore its data cannot be directly integrated for PV forecasting. To enable such a knowledge transfer, a multi-disciplinary team led by Prof. Hui Wang at Florida State University developed a method called iterative multi-task learning of Gaussian Process for time-series (iterative MTL-GP-TS) . The method fuses the PV data from different solar panels (Fig. 2a) to learn their relatedness or similar patterns and use such similarity to improve PV forecasting for solar panels with limited data (target). The method overcomes the challenge of identifying the between-panel relatedness/similarity among raw PV data collected from multiple similar-but-non-identical solar panels and selecting appropriate data sources to share information, thus avoiding incorrect knowledge transfer that potentially jeopardizes the forecasting accuracy. This research demonstrated the method based on the solar panels in several Hawaiian schools including Nanakuli, Jarrett, Highlands, and Waianae high/middle school. These schools all deploy solar panels supplied by the same manufacturer, Sunpower® and locate on Hawaiian O’ahu island. Thus, the solar panels in these schools have a similar setup condition that allows for the knowledge transfer. The results showed that the forecasting accuracy was improved by 18%-67% for different schools by the proposed method compared with traditional statistical methods (Fig. 2b). It is worth noting the significant improvement was achieved without considering the weather effect, a common factor that was employed to improve the PV forecasting by prior research. The study also found that it is not always beneficial to include the data from more solar panels into the PV forecasting. Adding more panels may generate very slight improvement or even negative impact on the forecasting Root-Mean-Square-Error (RMSE, an indicator of PV forecasting accuracy). A data source selection algorithm was developed to cope with this challenge . For the Hawaiian school study, it was found that the PV data from Nanakuli and Jarrett schools are the optimal combination to transfer information and improve the PV forecasting in Highlands school. Nevertheless, further inclusion of the data in Waianae school reduces the PV forecasting accuracy. A very useful implication of the iterative MTL-GP-TS is to forecast solar panel failures, allowing PV panel owners to take preventive measure before failure occurs. In some occasions when a solar panel lacks historical records of a certain failure mode to forecast failure occurrences, the available information on this failure mode from other similar solar panels can be transferred to forecast the failure probability. These findings are described in the article entitled Iterative multi-task learning for time-series modeling of solar panel PV outputs, recently published in the journal Applied Energy. This work was conducted by Tahasin Shireen and Hui Wang from Florida State University, Chenhui Shao from the University of Illinois at Urbana-Champaign, Jingjing Li from Pennsylvania State University, Xi Zhang from Peking University, and Mingyang Li from the University of South Florida. C Wan, J Zhao, Y Song, Z Xu, J Lin, and Z Hu. Photovoltaic and solar power forecasting for smart grid energy management. CSEE Journal of Power and Energy Systems, 1(4):38-46, 2015. Gordon Reikard. Predicting solar radiation at high resolutions: A comparison of time series forecasts. Solar Energy, 83(3):342-349, 2009. Yanting Li, Yan Su, and Lianjie Shu. An ARMAX model for forecasting the power output of a grid connected photovoltaic system. Renewable Energy, 66:78-89, 2014. Chen Yang, Anupam A. Thatte, and Le Xie. Multitime-scale data-driven spatio-temporal forecast of photovoltaic generation. IEEE Transactions on Sustainable Energy, 6(1):104-112, 2015. Christophe Paoli, Cyril Voyant, Marc Muselli, and Marie-Laure Nivet. Forecasting of preprocessed daily solar radiation time series using neural networks. Solar Energy, 84(12):2146-2160, 2010. T. Shireen, C. Shao, H. Wang, J. Li, X. Zhang, and M. Li. “Iterative Multi-Task Learning for Time-Series Modeling of Solar Panel PV Outputs.” Applied Energy, 212, pp. 654-662, 2018. Prior to joining FSU, Hui Wang was a research faculty as a research scientist and an intermittent lecturer at the University of Michigan. His research has been focused on manufacturing system design, automation, and process control by integrating applied statistics, image processing, optimization, and control theory with engineering knowledge with broad applications including automotive, energy system, semiconductor, and nano-manufacturing. His research has been sponsored by the US National Institute of Standards and Technology and National Science Foundation. His research in recent years has been conducted in close collaboration with a metrology company and U.S. manufacturing industries including Ford Motors and General Motors. His research has received the best paper awards from ASME-Manufacturing Science and Engineering Conference and International Conference on Frontiers of Design and Manufacturing and featured article recognition of IIE Transactions. He is a member ASME, IIE, and INFORMS.